Leicester boss Nigel Pearson may have gone viral after giving a reporter short shrift in the wake of the Foxes’ 3-1 defeat to Chelsea but he still has a way to go before he can rival some of the Premier League’s classic rants. In response to the King Power boss’s “ostrich” comments we asked you to vote for your favourite top flight rant of all-time and the Leicester boss came a distant third. There are no prizes for guessing who took the number one spot with former Newcastle manager Kevin Keegan taking the vote by a landslide with 53 per cent of the total for his “I would love it” meltdown. Sir Alex Ferguson’s Manchester United trailed Newcastle by 12 points – albeit with a game in hand – and the Red Devils gaffer attempted some of his famous mind games. It worked all too well with United clawing back the points to beat the Magpies to the title but not before Keegan got all shouty in front of the camera. 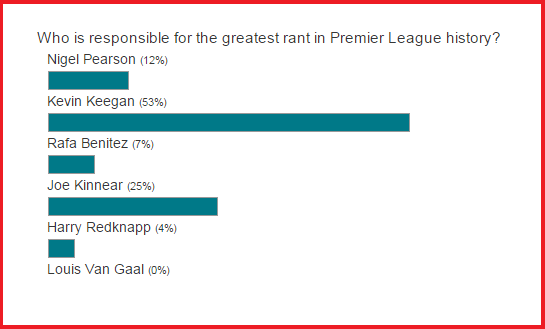 Second in the voting was Joe Kinnear with 25 per cent. Again the stresses of being at the Newcastle helm told with the former Wimbledon man blowing his top and dropping more F-bombs that a Snoop Doggy Dogg concert at some dismayed journalists. Pearson makes up the top three, taking 12 per cent of the votes for his latest outburst but with the frequency that he now loses his rag with reporters he could yet be crowned king at a later date. Rafa Benitez and his love of so-called facts earned the former Liverpool gaffer seven per cent of the votes and despite his sometimes curt responses to media questions Manchester United boss Louis van Gaal escaped scot free. The Dutchman has a tendency to take things personally and snap at reporters but with no votes whatsoever it seems he’s yet to annoy fans.